‘THERE IS NO smoking gun’. Part of the reason why the Central Bank won’t be making any reports to the Gardaí as a result of the ‘Anglo Tapes’. Central Bank Governor Patrick Honohan told the Oireachtas Finance Committee today that the tapes didn’t contain sufficient evidence to make a report to the Gardaí or the Office of the Director of Corporate Enforcement. “I don’t want to say that we have found that nothing happened, I’m just saying that we haven’t found that something has happened,” he said. Honohan was responding to questions from a number of Dáil deputies about yesterday’s statement from the Central Bank that “no new issues” had come to light as a result of the tapes. He rejected some of the media coverage following to the statement which he said suggested that the Central Bank saw no problem with the content of the tapes, a conclusion he said is not true. Honohan said that the Central Bank took the decision to make yesterday’s statement because “we felt we owe it to the public to say we’ve found no new evidence of criminality when we didn’t”. Among the revelations in the tapes was a quote from Anglo’s John Bowe that the bank had sought to mislead the Central Bank about how much capital was required by the bank in the days leading up to the bank guarantee. We are not an entity that investigates criminal matters, if criminal matters come to our attention then we pass them to the Gardaí. So it’s a bit undirected to say, “Why don’t we get our hands on hundred of hours of tapes and trawl through them”. There may be people that have financial interest in doing this but we’re not going to get any more money out of Anglo Irish Bank and if its to do with with criminal matters we don’t have any authority there. “This doesn’t stop anyone doing any further work on this it doesn’t stop anything, ” he had said earlier. In a testy exchange with committee member Kieran O’Donnell of Fine Gael, Honohan said that the Central Bank did not have any information that was not available to the Gardaí, “Without being facetious do you want me to pass on a copy of the Sunday Independent?,” he said. Honohan was also questioned by Doherty about why the former Anglo executives heard in the tapes were allowed to remain in their positions and indeed be promoted. The governor accepted that it was a pertinent question but referred to the words of former Deputy Matthew Elderfield who had previously told the Public Accounts Committee that taking actions against individuals is “difficult in the structures that we have”. A possible criminal offence of reckless misconduct in the management of a bank. We’re talking about mismanagement on a large scale here, you are the members of the Oireachtas, we come up against barriers that are legislative barriers. Email “Anglo Tapes: “No smoking gun” says Central Bank boss”. 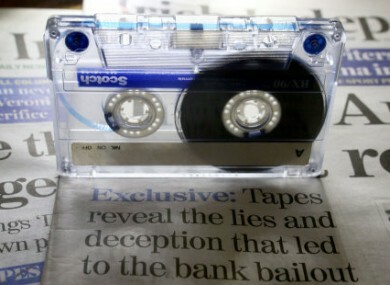 Feedback on “Anglo Tapes: “No smoking gun” says Central Bank boss”.